With the two Canadian IndyCar visits for 2010 now in the history books, the NASCAR Nationwide visit to Circuit Gilles Villeneuve in late August is one of several major auto racing visits left up north. For the August 28-29th event, J.R. Fitzpatrick will be competing in the #7 Chevy wearing Schick Hydro colours while Fellows will be driving the #88 Canadian Tire Chevrolet Impala SS. 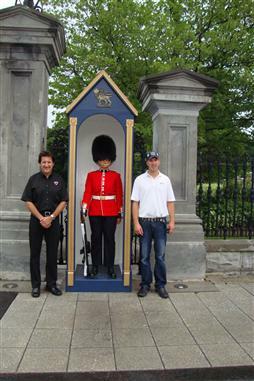 Making a special stop in the Canadian nation's capital, the JR Motorsports teammates for the upcoming Canadian round Ron Fellows and JR Fitzpatrick made a special pitch. Promoting the NAPA Auto Parts 200 presented by Dodge, the event will take place on August 28-29 down the road to Montreal, Quebec just about a two and a half hour drive from Ottawa. Posing on Parliament Hall (Void of many politians as the government gatherings are on summer break), Fellows and Fitzpatrick also made stops at local media outlet including sports/talk radio station The Team 1200. On a personal note, I have recently had the privilege of meeting both drivers at the recent Honda Indy of Toronto event. While I've written profiles of each driver which resulted in two separate articles (Fitzpatrick's profile graced the inner pages of Canadian motorsport publication PRN Magazine and Fellow's interview can be found on this website.) it was my first face-to-face experience with two of Canada's more talented racers. You can count on XSL Speed Reporter's attention on the upcoming work of these as well as other Canadian drivers.